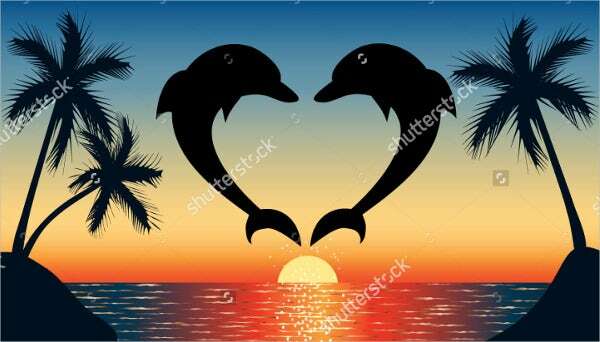 Dolphins are one of the most highly intelligent animals that had befriended humans for a long time. 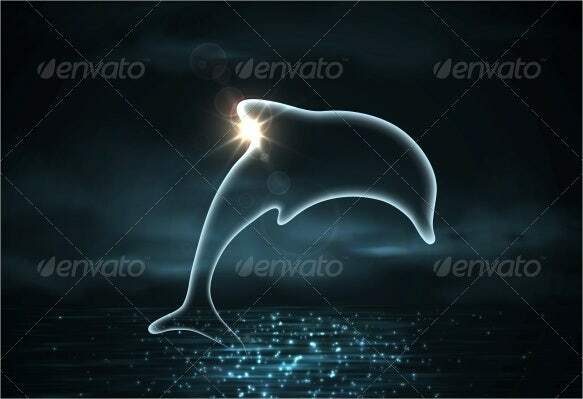 This is because of the dolphins’ extraordinarily display of culture which was considered to be unique among human beings. 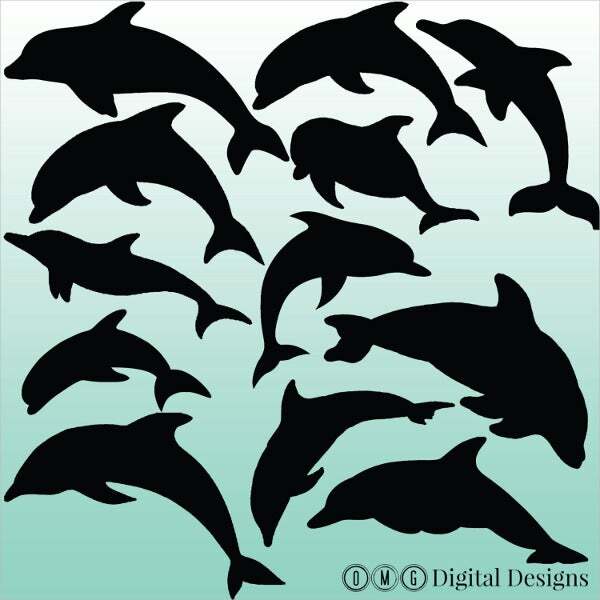 Dolphins are fascinating in a lot of ways, and using them in your design ideas can surely generate interest and excitement, as dolphins are entertaining as they are endearing. One way to use these well-loved mammals in creating works of art is through silhouettes. A silhouette is a two-dimensional representation of an object where the image is cut out and filled with a solid color. 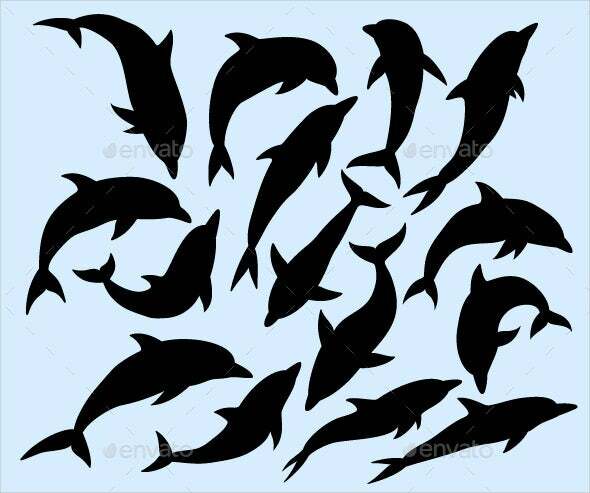 Below is a collection of dolphin silhouettes, as part of our series of Animal Silhouettes, that you can download and use for your projects. 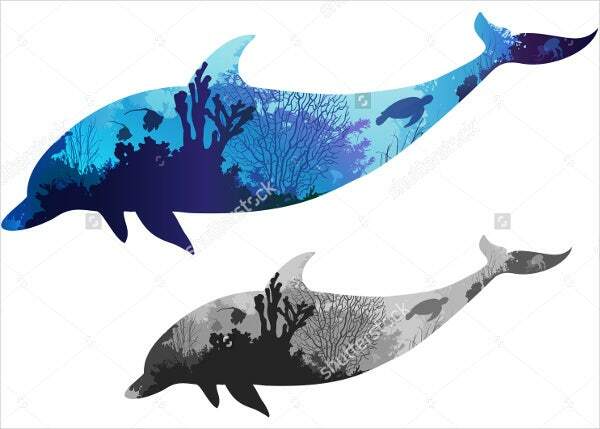 There are various reasons why you should integrate these animals and use these silhouettes into your designs. Dolphins are highly intelligent animals. Superior to most species in the animal kingdom, dolphins are able to use tools and teach them to their young ones, as well as developing high forms of communication. They also use a natural version of radar to navigate and find food. 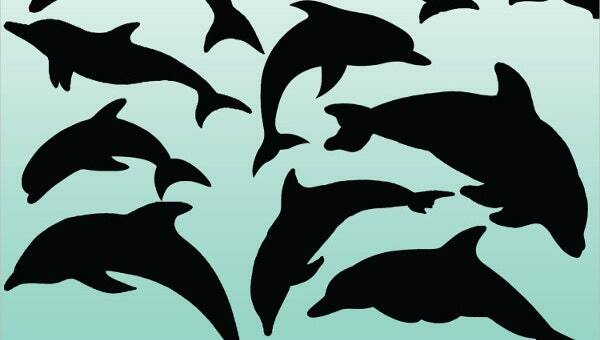 Dolphins are altruistic animals. They are known to have compassion which enables them to stay and help injured people and animals alike to heal, even helping them to the surface to breathe. 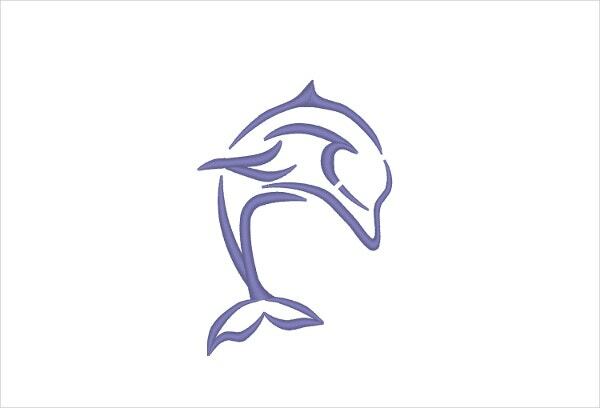 There are also many accounts of dolphins helping fishermen and even whales to fish. Dolphins are incredibly social animals. 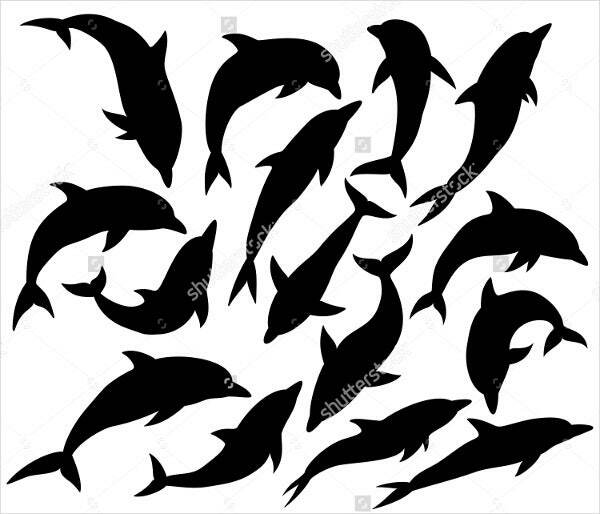 If you have seen dolphins in the wild, you will notice that they live in groups called pods, where they cooperate with each other and hunt together to surround a school of fish and get food, while helping each other in raising their offspring. Dolphins are extremely playful animals. Dolphins play with each other and with seaweeds. Their agility enable them to hop out of the water, which provides amusement to the watchers. They have been interacting with humans for as long as we have known of their existence. 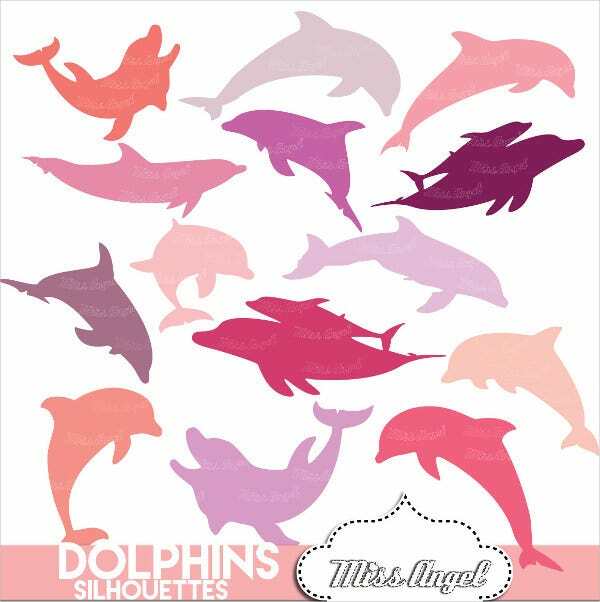 Don’t forget to take a look at our compilation of Dinosaur Silhouettes for more fun and exciting animal design ideas. What Are the Types of Silhouettes? Painted silhouette. Painted silhouette is created by using black ink or paint to draw the image onto a base such as paper, plaster, or porcelain. Silhouette types, especially painted silhouettes, are usually categorized by form—namely, full-length, images, or busts. Hollow-cut silhouette. Hollow-cut is usually used for portraits created with paper. The image is cut away from the paper that is usually in light color, which leaves the negative of the image. It is then mounted over a dark paper or fabric. Cut-out silhouette. As opposed to hollow-cut, cut-out silhouettes are created by removing the paper surrounding the outline producing the positive shape of the image. It is then mounted onto a background such as a white card stock with an adhesive. 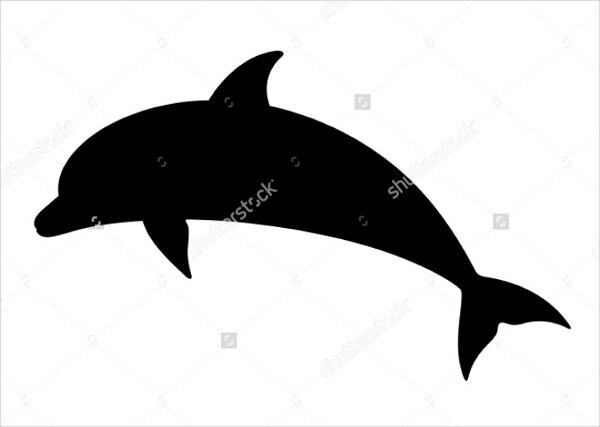 Animal images can be a great addition to your design ideas, especially when integrated properly, and there are may ways that you can use the dolphin silhouettes on this page. Also, check out our Lion Silhouettes compilation.